When I was growing up, my family had an advent calendar. It was a simple, pretty one made out of felt by my mom's friend. It had a Christmas tree with tiny hooks on it and numbered pockets at the bottom, each containing a little silver bell. Every day, you took the bell out of the pocket and hung it up as an ornament on the tree. 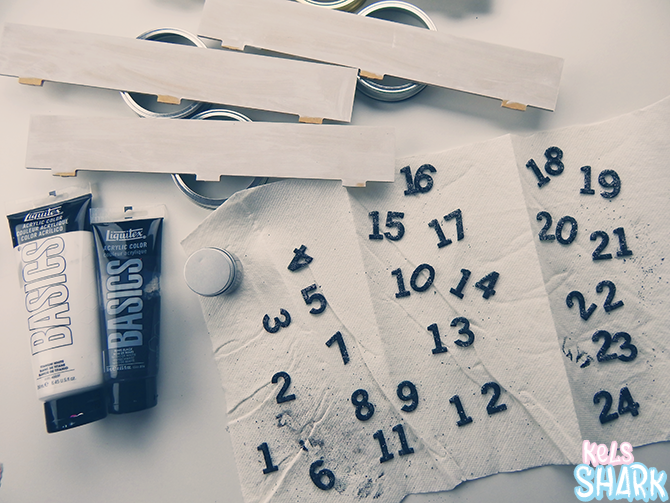 We always had fun doing our annual Christmas countdown with the advent calendar. I've always had a strong love of gifts and gift-giving (if that wasn't obvious from the twelve days of gift guides). 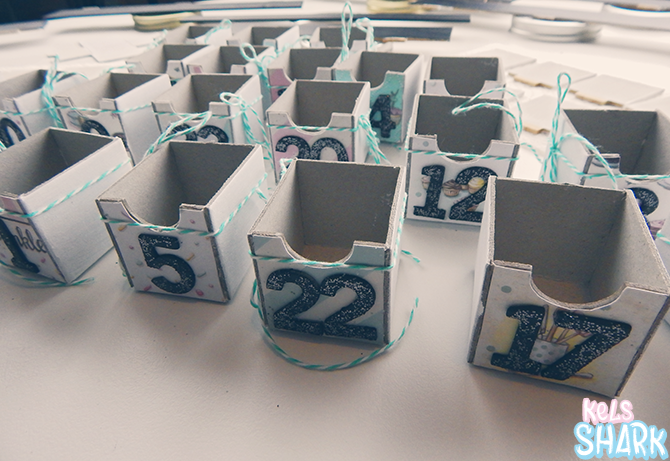 While brainstorming fun Christmas projects, I thought it would be so much fun to make my own advent calendar with daily pockets for tiny gifts! Soo... this should be obvious from my BlytheCon post, art collector gift guide and other posts, but in case you missed it, Mab Graves is one of my top favorite artists. When I saw the Little Lost Girls Paper Dolls book on her site, I ordered two: one to keep intact, the other to use for projects. Likewise, I've mentioned my friends Jenny and Aaron, the super sweet and talented duo behind Everyday is a Holiday, in the Sweet Life coaster project and paper crafter gift guide. 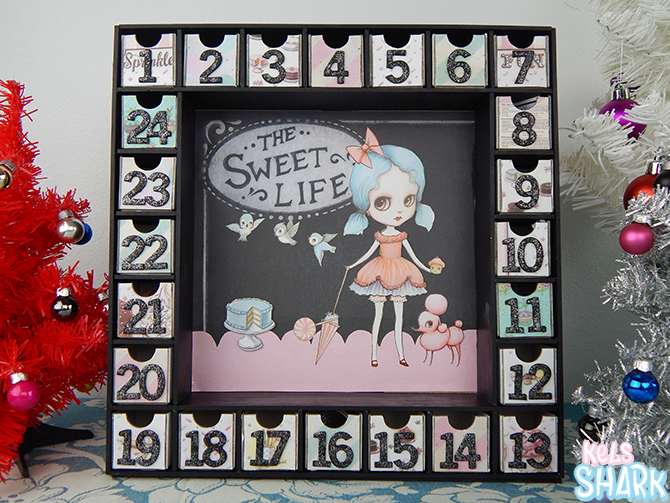 This isn't the first project I used the Sweet Life papers for... and it's unlikely to be the last, either! 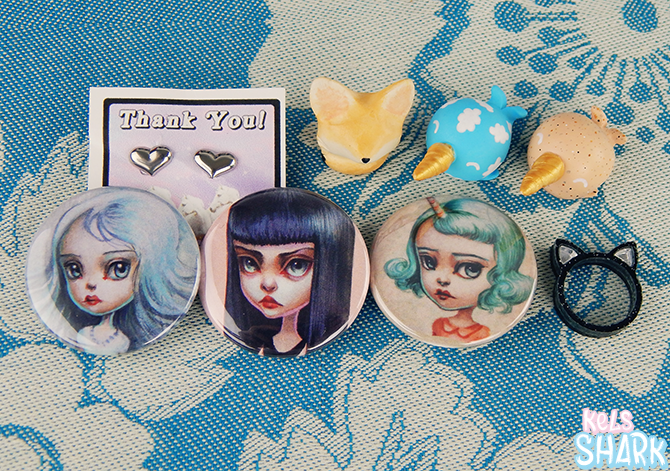 Now, tell me what you think: Mab girls x Jenny & Aaron sweets x 24 tiny gifts x Christmas countdown = match made in heaven? I thought so! Trying to explain every step would be insanity as this project took me something like three full days to complete. However, I will list every material I can remember using and include some process photos. I encourage you to please do ask questions if you want to know how I did something as I'd love to share! 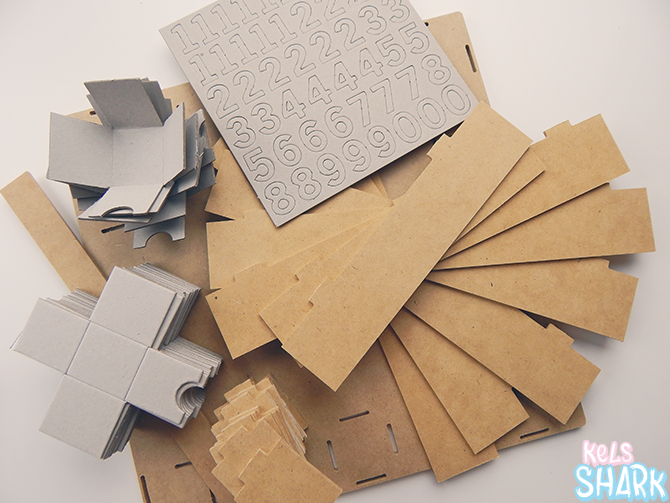 Kaisercraft advent calendar kit: lots of assembly required. My fave way to use lids from mason jars: drying racks for project pieces! 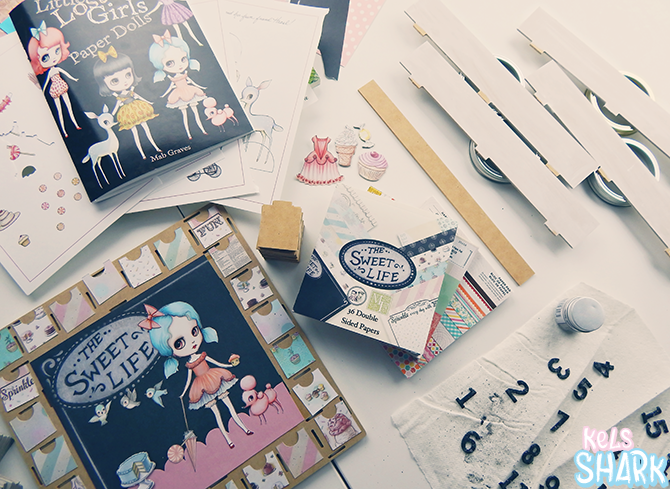 Deciding which outfit + chipboard sweets to use! 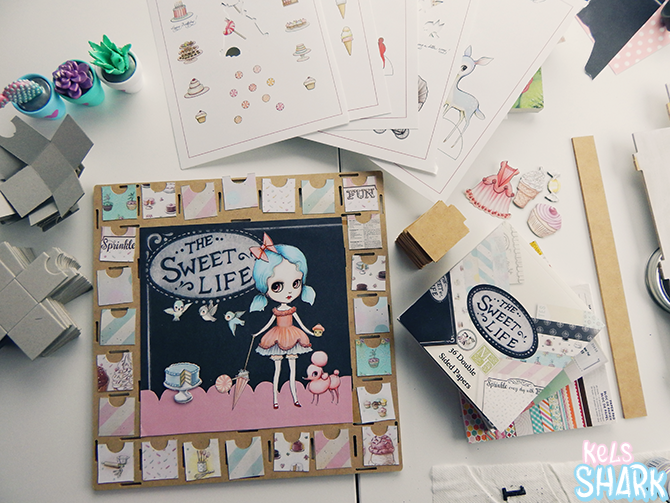 Don't worry: I cut out the cake part of the Sweet Life 12x12 paper to use for a future project! I used baker's twine to keep the drawers secure while the E6000 dried. I convinced Tal to fill up advent calendars for each other. Originally, I planned to do another calendar more suited to his tastes, for me to fill up with goodies for him. 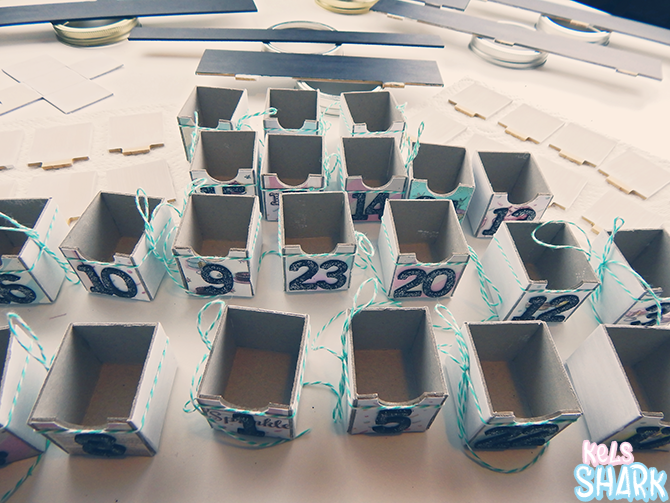 However, this project took forever and I ran out of time, so I made him a simple calendar for this year (and the fancy one is on hold for next year). Absolutely gorgeous! I've always toyed with the idea of an advent calendar but I'm sure I would just forget about it after a few days. Ha! Thanks, Tara! I totally know what you mean. :) I think part of the reason I haven't forgotten about it is because it took so long to make! Hehe. Thanks, Jessica! They're SO much fun! And if all else fails... you can never go wrong with chocolate. Bwahahaha! Thanks, Sarah! You're too kind! Wow, this is incredibly impressive work! Amazingly well done of you :) Looks really cool.